Everyone knows that in order to make the perfect margarita all you need is a Frozen Concoction Maker. Just blend some tequila, citrus liqueur, lime juice, sugar and ice and you'll be ready to go. But whether you're sipping a margarita after a long day of work or throwing a cocktail party with your friends, it's important to have a tasty dish that complements your cocktails. Nothing is better than a fresh bowl of salsa with some crispy tortilla chips. The sweet, salty and spicy combination of salsa is the perfect complement to your sour and tangy lime margaritas. Make your own salsa at home with a few common ingredients and impress your friends with a delicious and inexpensive snack. Serve delicious homemade salsa with a margarita or two. Salsa is a hugely popular chip dip whether you're throwing a party, watching sports or just having a appetizer. While many people buy salsa from the store, it's actually very easy to make at home. Without breaking the bank or getting any new appliances you can make garden-fresh salsa that your friends will love. 1. Start by chopping the tomatoes, onion and peppers into large chunks. Seed the peppers and tomatoes as needed. 2. Cook the chopped vegetables on the stovetop in a skillet to give your salsa a smoky flavor. Cook for a few minutes until the vegetable skins are seared and darkened. 3. Place your seared vegetables into a food processor. Add cilantro, salt, black pepper, lime juice and cumin in the food processor. PULSE for about 5 seconds multiple times until you reach your desired consistency. 4. Pour your salsa into a bowl and serve with some delicious chips. You now have a great, fresh salsa that's as authentic as can be and goes well with your frozen margarita. This is just one variety of salsa that you can make in your kitchen. The truth is nearly any salsa will go great with your margaritas. Consider one of these salsa types after you master the classic tomato salsa. Fruity Salsa - Add a little pineapple, mango or peach to your salsa for something truly tropical. These flavors go great in both spicy or milder salsas. Hearty Salsa - Classic salsa can be great because it's so light and refreshing. But if you'd prefer something a little heartier why not add some beans and corn? This popular variety of salsa is a great middle ground between chili and salsa. 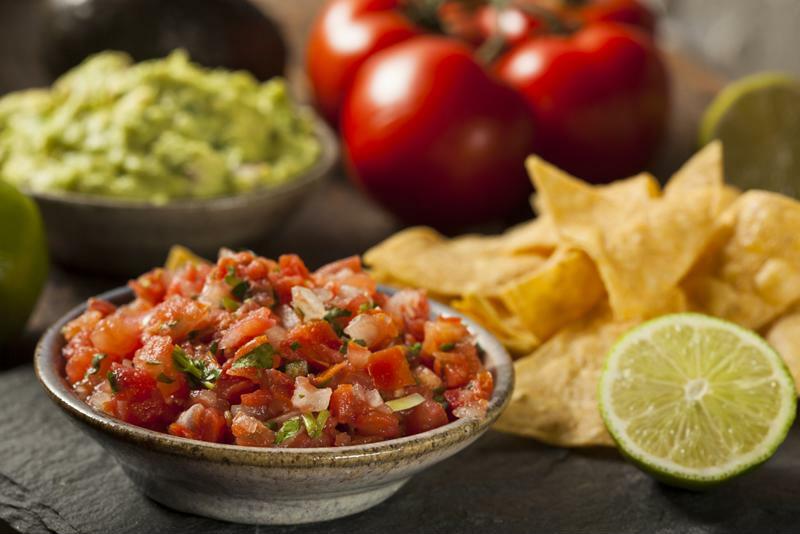 Pico de Gallo - Also known as salsa fresca, pico de gallo is simply a combination of uncooked salsa ingredients. Fresh tomatoes, onions, cilantro and peppers are just diced and mixed together. This is a great option with chips or on a burrito or taco. Consider adding a little avocado too. Salsa Verde - Made with tomatillos as the main ingredient, this special green salsa pairs well with both the color and taste of your margaritas.